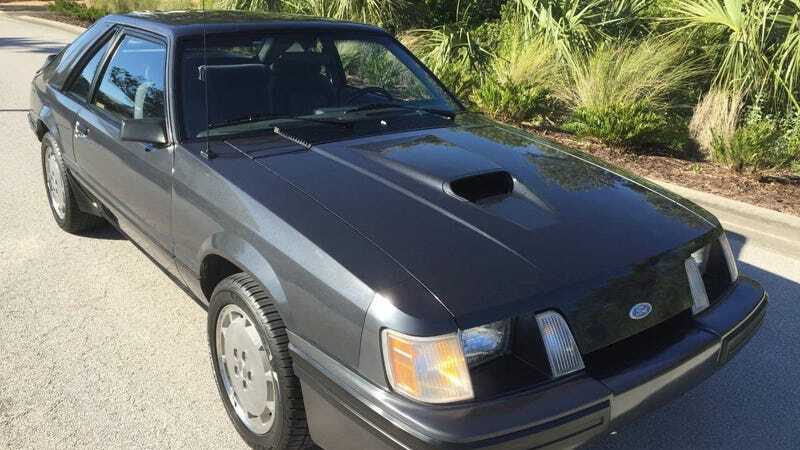 At $12,500, Could This 1984 Ford Mustang SVO be a Pony Worth Possessing? You may not be able to afford the new GT500, but you may be able to swing the asking for today’s Nice Price or Crack Pipe SVO ‘Stang. It may not be as awesome as the new Shelby, but it’s arguably the quirkiest performance Mustang there ever was. Let’s see if its price can make that quirk work. The discovery of El Dorado, a mythical South American city of gold, long bewitched the chartered pirate, Sir Walter Raleigh and a slew of Spanish Conquistadors throughout the 16th Century. It was never found despite its glories being amplified over the years from that of a king to a city to an empire. A side effect of all the greedy grubbing was that the South and Central American region said to hide the lost city of gold would become the most thoroughly and accurately mapped region of what the Europeans then called the New World. The seller of yesterday’s 1983 Cadillac Eldorado Touring Coupe was also looking for gold, or at the very least green—$15,500 of it. Unfortunately, an old Eldorado worth that kind of cash is also a myth, at least according to the massive 88 percent Crack Pipe loss the car received here. When I was talking about that Caddy yesterday, I noted that the Touring Coupe model was one of GM’s reactions to the changing ideals of American luxury car buyers— those who at the time were moving away from ticky-tacky to straight on Teutonic. That sort of thinking, but from a performance perspective, is also what lay behind the creation of the 1984 Ford SVO Mustang we’re featuring today. The Mustang had always been a bit of a bruiser. V8 power and straight-line performance had long been a hallmark card of the eponymous pony car line. With the SVO, Ford set out to build a Mustang with a more European ethos—one that could handle and offered up its performance with a modicum of efficiency. That’s what got us a turbocharged four cylinder under the hood that put out the same sort of horsepower as did the V8-engined GT, revived the same year. There were turbo Lima-powered Mustangs before the SVO, but none offered up anywhere near as much power. The increase came from an air-to-air intercooler and electronic engine management that could vary output depending on fuel octane, selected via a dashboard-mounted switch. On premium, the blown SOHC 2.3 gave it up to the tune of 175 horsepower. A functional NACA duct on the SVO-unique hood fed the short-run intercooler, nestled cozily next to the cam cover. Behind the hot four sat a Borg-Warner T5 five-speed stick operated through a specifically-designed Hurst shifter and sending power back to a Traction-Loc LSD rear end. The drivetrain was just the start of the features that were unique to the SVO or at least leveraged for its application. Others included 4-wheel disc brakes from the larger Lincoln MK VII, a specially valved steering rack from TRW that offered on-center feel like no other ‘Stang, and a clutch sourced from Dyken to handle the four pot’s power. Other updates included a brake pedal from an automatic transmission foot box for improved heel and toe work, unique hubs and spindles for the front suspension, and tuned Koni shocks all the way around. Visually, the SVO was like no other Mustang as well. The grill-less nose was non-traditional even if it was obviously designed for flush lights that didn’t make the cut. Those would come in ‘86, following a change in Federal Regulations that was spearheaded by Ford. Thanks, Ford! Out back, the bi-plane spoiler in back was unique to the model as well. There are literally dozens of other SVO exclusives on the car and that’s why the seller’s description of this one as being “factory stock” is so important. The ad says that nothing on the car other than the battery and tires has been touched. With just 23,300 miles on the clock, it’s not unreasonable to assume that the car still comes armed with its factory brake pads and other consumables. Scary yes, but still rather impressive. The car comes in Dark Charcoal Metallic over the factory grey cloth interior. No other interior hue was offered and nicely, this car still carries its suede-like dash panels, SVO-unique Hurst shift knob and three-spoke badged steering wheel. Hell, it even has the terrible old Ford AM/FM cassette head unit at the bottom of the dash. Everything inside looks to be in good shape with just some minor wear on the outside bolster of the driver’s Lear/Sigler-sourced seat obvious. There are few complaints to be had on the exterior too. The paint holds a shine and there’s no scuffing on the bumpers at either end. The un-badged factory alloys seem reasonably free of curb rash as well, although whomever hammered a balancing weights on the outside of the one highlighted should be publicly shamed. The clean presentation continues in the engine compartment and underneath where there’s no indication of any accidents, rot, or other malfeasance. The title is clear and the asking price is $12,500. That’s a lot of money for an old Foxbody Mustang, but then this SVO is a lot of Foxbody Mustang. When it was new, it went for over six-grand more than the V8-powered GT. That’s probably why its model run was so short. These days, you can find SVOs in various states of disrepair, but few as solid or original as this one. Do you think that fact could possibly make it worth that $12,500 asking? Tampa, FL Craigslist, or go here if the ad disappears. H/T to Charley Demosthenous for the hookup! At $15,500, Might This 1983 Cadillac Eldorado Touring Coupe Turn Your Garage Into the Caddy Shack?